chevron lubricants lanka creates history by reaching a decade of safe operations in Sri Lanka | Welcome to Chevron Lubricant Lanka PLC. 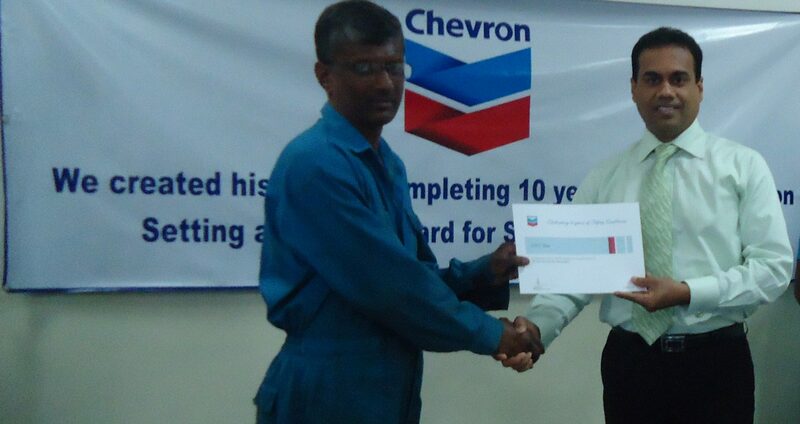 Mr. Kishu Gomes, MD / CEO of Chevron Lubricants Lanka PLC handing over a certificate of appreciation to a Chevron employee during the ceremony held to commemorate the landmark achievement. Certificates were given to all Chevron employees, whose combined effort helped achieve exceptional safety results. Chevron Lubricants Lanka PLC, the pre-eminent marketer of Caltex branded lubricants Havoline, Delo and Lanka, today announced the achievement of a decade of safety excellence for its operations in Sri Lanka, which is a significant milestone for the Company, as well as its people and the industry. This exemplary achievement underscores Chevron's commitment to attain world class performance in every aspect of the business. "No employee or contractor of the company has stayed away from work due to a workplace injury during this 10 year period. For a petroleum based manufacturing organization, this is a significant milestone to achieve and is a true reflection of the determination and commitment of our employees, and the world-class safety systems and processes in place to help our employees achieve exceptional safety results. By this we are also setting a new performance standard for other companies operating in Sri-Lanka" commented Mr. Kishu Gomes, Managing Director/CEO of Chevron Lubricants Lanka PLC. "It is the 'zero incidents' is achievable mindset that helps us achieve record-breaking standards in safety and operational excellence. After all, the ultimate success of improved safety performance depends significantly on the preventative principles inculcated in the minds of every employee" he continued. Chevron's firm commitment and exemplary leadership towards OE is embodied in The Chevron Way value of protecting people and the environment, which places the highest priority on the health and safety of its workforce and the environment and communities in which it operates. As a business and as a member of the world community, Chevron is committed to creating superior value for its customers, business partners, local communities and workforce.